The Silk Road online marketplace has resurfaced about a month after U.S. officials shut down the website that was only accessible through the Tor anonymity service, and arrested among others a man named Ross William Ulbricht, who was alleged to be the site's owner and operator. The site has been relaunched by a person styling himself as Dread Pirate Roberts, a handle linked to Ulbricht by the U.S. Federal Bureau of Investigation. Before its closure, the Silk Road was associated with the illegal sale and distribution of drugs and other illegal items including fake passports, the FBI said in a complaint in September. "It is with great joy that I announce the next chapter of our journey. Silk Road has risen from the ashes......" Dread Pirate Roberts wrote in a note on the new website which could be accessed through the Tor service. Dread Pirate Roberts cautioned that the site was still in early phases of development and lacked some of the features of its predecessor. Security appears to be the focus of the website. It promises to encourage and reward users who report both theoretical and even proven exploits. The website also warned of possible delays with account withdrawals and deposits initially, because of an expected surge at opening of deposits of the virtual bitcoin currency. Law enforcement agencies suspect bitcoin is being used for money laundering and other illegal activities as it allows users to remain secret. "These delays should become less as the marketplace settles, but at least for the earlier stages, please do not report coins as missing unless 12 hours or more have elapsed," the website said. In the event of Silk Road's demise once more, no members will lose their coins, as a result of new emergency strategies in place, it added. Ulbricht appeared in a federal court in New York on Wednesday and his lawyer said officials arrested the wrong man, according to reports. The new website shows that government policy needs to adapt to the "inescapable reality that technology is dynamic and ever-evolving," said Tom Carper, U.S. Senator for Delaware in a statement on Wednesday. "Rather than play 'whack-a-mole' with the latest website, currency, or other method criminals are using in an effort to evade the law, we need to develop thoughtful, nimble and sensible federal policies that protect the public without stifling innovation and economic growth," said Carper who since April is leading an inquiry into virtual currencies. Dread Pirate Roberts claimed in a Twitter message earlier on Wednesday that 7,000 people had registered so far and there was no sign of slowing down. "7,000 more voices who add to the call of freedom," the person added. 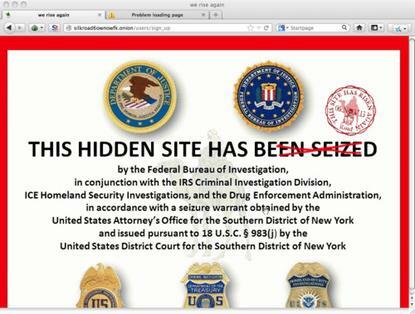 The opening page of the website scratches the "been seized" from an image of a legal take down notice, and stamps it with "This site has risen again."